Marine protected areas are parts of the NSW marine estate managed to conserve marine biodiversity and support marine science, recreation and education. National parks and nature reserves – include around 20,000 hectares of estuarine and oceanic habitats. The Department of Primary Industries undertakes the day to day management of marine parks and aquatic reserves. Marine protected areas are part of the broader new approach to marine estate management. Marine 'biodiversity' is the variety of animals, plants and habitats found in the marine estate and conserving marine biodiversity is a fundamental part of keeping the estuaries and oceans of NSW healthy and productive into the future. Systems of marine protected areas are an important way of conserving marine biodiversity. 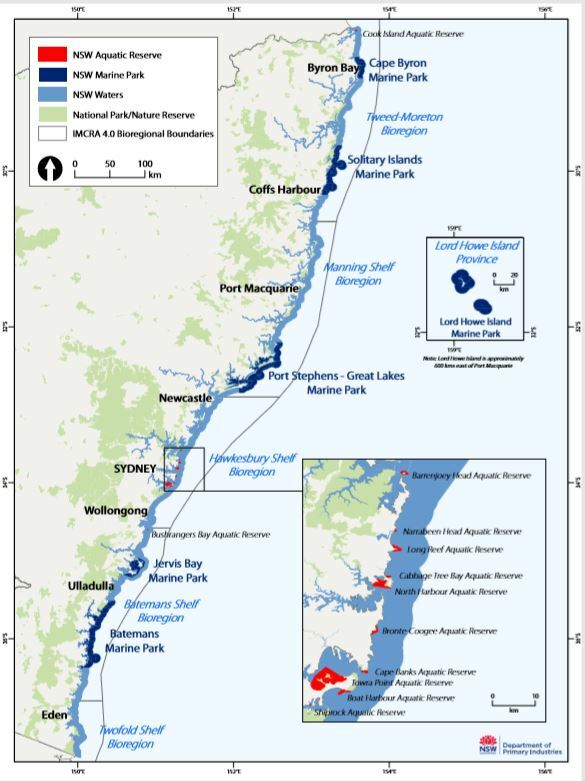 Marine protected areas in NSW are part of national and international systems, including Australian marine parks. Other important aspects of conserving marine biodiversity include marine pollution reduction programs, climate change responses, marine biosecurity, threatened species recovery, resource use and boating management, land-use planning and catchment management.